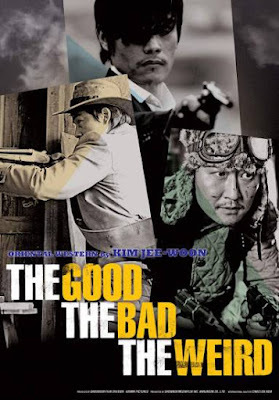 Maybe you'll enjoy the first-ever "Kimchi Western" -- Kim Jee-woon's The Good, The Bad and The Weird, an epic South Korean production described by one critic as a wild and woolly mix "of Sergio Leone’s Spaghetti Westerns, George Miller’s apocalyptic road movies and a frantic brand of comedy that’s quintessentially Korean..." It won't open until 2009 in the USA, but it's a gala presentation at this year's prestigious Toronto International Film Festival. So I hope to give you a report after I catch a TIFF screening next week. In the meantime, here is what the original South Korean trailer looks like.